The Bulls play an early morning game today, at 10:35, and then move on to a 3-game set in Rhode Island before they come home. So far the trip has been a good one, including last night. Last night was a game with a sudden dramatic series of events in the 4th inning and then a good job of keeping things on track. With two outs and two runners on Taylor Motter, Alexi Casilla, and Mikie Mahtook drove in five runs to put the game away. 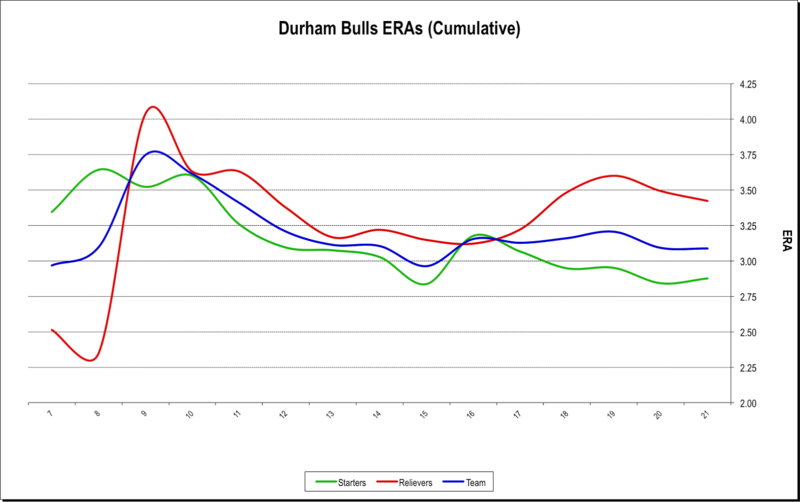 This chart looks at the ERAs of Bulls pitchers. ERA (earned run average) is a stat that has gone out of fashion among the sabremetricians, and for a lot of good reasons. Our purposes, however are a bit different from most. What we’re interested in is team pitching performance and trends. For that purpose, the number of earned runs per nine innings — ERA — is a decent metric. We’ll chart a couple of others as the season goes along. What we have here is the cumulative ERA of the team, the starters, and the relievers, over the last 15 games. That is, after each game we add up the total number of innings and earning runs and calculate the ERA. This is a very small sample size, so you can expect (and you can see) a good bit of variability this early in the season. But a few things are obvious, one being that the relief crew isn’t doing all that good a job at the moment. We should not put too much stock in that just yet because the sample size problem is even worse. Relievers have pitched 71 innings to the starters’ 112 ⅔. Note that the Bulls have had 17 different pitchers on the mound so far this year, ranging from Matt Buschmann’s 25 ⅔ innings to Jose Dominguez’s 2. The team ERA of 3.09 ranks the Durham Bulls as 5th in the International League, below league-leading Buffalo’s 2.06 and well above the league-worst Louisville’s 4.93.